1. You’ll see you’re not alone. Our customers and prospects are sometimes shy to admit they have dispute resolution needs for fear that it gives the false impression that they have problems other companies don’t have. The reality is every single company in the history of companies has every challenge in the book. And attending a conference like this is nice for reminding us we’re not alone, cathartic even. 2. You’ll learn a ton. I went last year for the first time and saw a lot of people nodding heads and taking notes. Also notice a lot of people repeat attend. And seem to get a lot of great substance out of it. Even beyond the programming, everyone was super engaged and chatting a lot about how they approach common problems. 3. It’s “sharing economy prom.” Like the White House Correspondents dinner or the Oscars, everyone who’s anyone will be there. All the biggest, smallest and medium sized marketplaces. I don’t even have to name them ‘cause they’re pretty much all gonna be there. 4. The food’s good. You can pretty much always find me at the food station. And one thing I can guarantee – the food’s good and plentiful. 5. We’re starting a trade group. The sharing economy needs to stick together to brainstorm creative solutions to brand new, difficult problems. 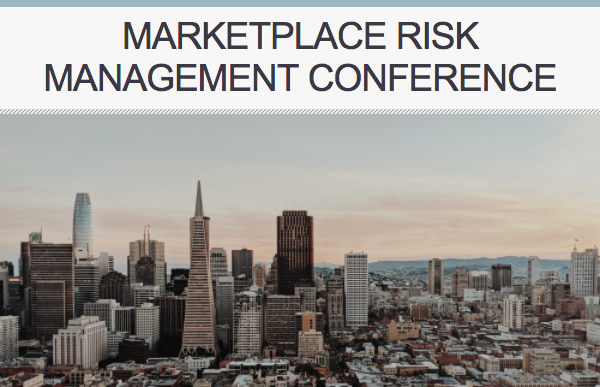 Marketplace Risk is a center of gravity for the industry and a natural place to start a trade group to address these issues. You can get involved and benefit from it. Help make history! Hope you can join. We’re sponsoring so please let me know if you want a ticket. Or visit https://www.marketplacerisk.com/.